Lifeline Community Action (LCA) are a Charitable Incorporated Organisation based in Newton Aycliffe, County Durham providing emergency aid and supporting services to families and individuals who find themselves in great need. 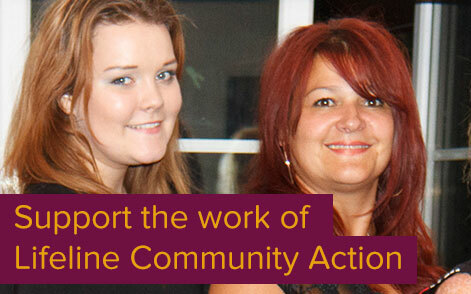 LCA is a volunteer led charity who work with a Christian ethos. Our beneficiaries tend to be from the most disadvantaged communities in South Durham but can be from anywhere in County Durham and Darlington and are primarily referred to us from other Voluntary Agencies, Health Visitors, Social Workers, Midwives and other Statutory agencies but we also accept self-referrals. We provide emergency food and household goods packages, essential goods for a new mum and baby packages, help to find work and money management courses. Our aim is not to just to provide a lifeline during a crisis but also to provide the basic skills someone may need which currently prevent them from returning to the situation that caused them to need the help in the first place. If anyone finds themselves in financial crisis, please don’t hesitate ringing the charity phone 07936 431262. Your call will be dealt with sympathetically by one of our team.